So, we've covered some of the ground support options in the last post, now lets think about air support. Air support is as wide and varied as ground support. It can be as simple as a fighter aircraft, flying low and strafing the ground with machine gun fire or as complicated as an orbital drop-ship, capable of descending through the atmosphere with a payload of troops, dropping them off and then hanging around to give weapon support while they advance. Let's start, as we did last time, with what is available from a war-gaming model perspective. Again, we'll start with the obvious choice of Games Workshop plastic injection kits. In the Imperial guard line, there is the Valkyrie; a sci-fi version of a helicopter heavy-lifter. The Tau range has a selection of anti-gravity vehicles ranging from the Devilfish troop carrier, through heavy support Hammerheads and Sky-rays to the lightly equipped, 2 man scout skimmer Piranhas. 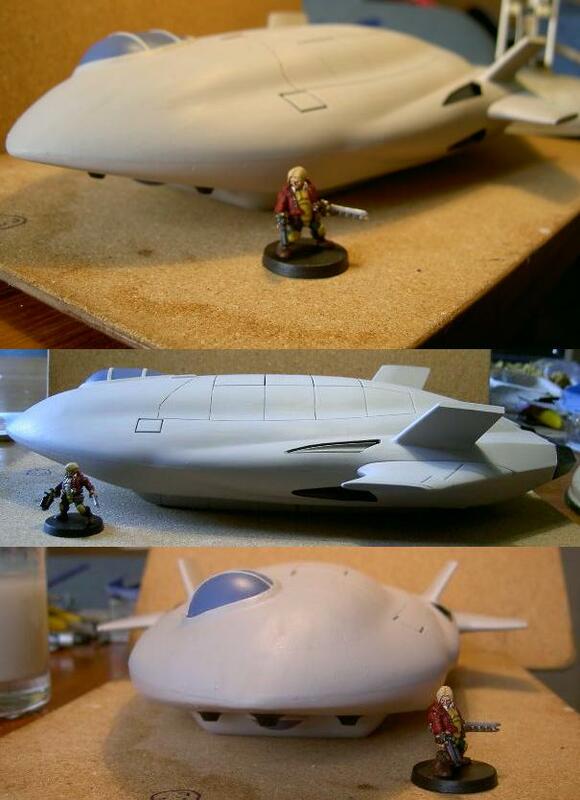 The Eldar have everything from troop carriers to jet bikes and even the Space Marines have Landspeeders to add some lightly armoured ground support. If you want to continue on the Games Workshop theme, their sister company; Forgeworld, have further fliers to add to the mix but they tend to cost a lot more because they are resin. Old Crow Models also have a few VTOL support craft in the guise of the Raven, Crow and Splinter. These are resin and are 25mm scale so are small enough for the Grymn to use. Scotia Grendel has the resin, Corvus drop-ship in their Grendel sci-fi section. Antenociti's Workshop has a couple of resin fliers including jet-bikes and even a city hopper. ...and to be brutally honest, I can't think of any more! There really are a lack of companies making wargaming fliers for sci-fi...particularly drop-ships. Generally speaking, the 1/48th scale aircraft kit industry has thousands of kits available for conversion. I'm not going to list company names because there are so many out there that produce 1/48th scale models. All it takes is a little imagination and you can convert a Chinook into a VTOl for sci-fi, A Commanche into a ground attack VTOL, A Hercules into a Drop-ship and a host of modern jet aircraft into some form of fighter/ground support aircraft...the sky is the limit. If you look a bit further afield, there are a lot of sci-fi kits available...like the Macross and Mospeada range. They have a great selection of fighters. There are also a host of other sci-fi kits from the 'real space' genre; including rockets and shuttles to use in your conversions. Like I said at the beginning...a small amount of imagination and you can easily construct a decent amount of sci-fi airsupport for your Grymn. All I did was fill in the windows, trim the tail a little and stick a plastic spoon to the front to act as a cockpit...sorted! 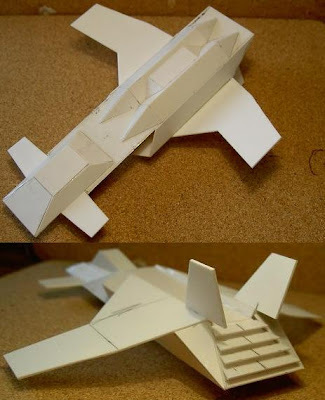 All I can say is that if you take the scratch-building approach...GOOD LUCK! Well, that is about it for today and I hope that I have supplied at least a small amount of information that you may find useful when tooling up your Grymn forces with some air-support. If you have any other options for either ground or air support then please feel free to add comments to any of the posts...an idea shared is a wonderful thing after all! also the revell star wars kits have many options. It is all grist for the mill so I always welcome other suggestions. Paper...I forgot to mention paper! Support for the lowly infantry. Time for some pix again.